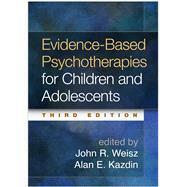 by Weisz, John R.; Kazdin, Alan E.
Widely regarded as the standard reference and text on evidence-based therapies--and now substantially revised--this book has introduced tens of thousands of clinicians and students to exemplary treatments for social, emotional, and behavioral problems in children and youth. Concise chapters focus on specific psychotherapy models. The developers of the respective approaches review their conceptual underpinnings, describe how interventions are delivered on a session-by-session basis, and summarize what the research shows about treatment effectiveness. The book explores important questions and challenges facing the field and identifies best practices for treatment dissemination in real-world clinical contexts. *Existing chapters significantly revised with the latest treatment research. *Chapters on assessment, personalizing evidence-based therapies, clinical implications of developmental psychopathology, and advances in neuroscience. *Coverage of additional clinical problems (self-injury and suicidal ideation, bulimia nervosa, encopresis) and treatments (Early Start Denver Model for autism spectrum disorder, Internet-assisted and technology-enhanced interventions). *Chapters on implementation in complex mental health systems, as well as international models. John R. Weisz, PhD, ABPP, is Professor of Psychology in the Department of Psychology at Harvard University, and at Harvard Medical School. He is Director of the Laboratory for Youth Mental Health in the Department of Psychology. Dr. Weisz served for eight years as President and CEO of the Judge Baker Children’s Center, affiliated with Harvard Medical School. His research focuses on development and testing of psychotherapy programs for youth mental health problems, as well as meta-analyses and systematic reviews of psychotherapy research. Most recently, he has been involved in developing and testing transdiagnostic approaches to youth psychotherapy designed for implementation in clinical and school settings. A past president of the Society of Clinical Child and Adolescent Psychology (Division 53 of the American Psychological Association) and the International Society for Research in Child and Adolescent Psychopathology, Dr. Weisz is a recipient of the James McKeen Cattell Lifetime Achievement Award from the Association for Psychological Science and of the Klaus Grawe Award for the Advancement of Innovative Research in Clinical Psychology and Psychotherapy from the Klaus Grawe Foundation in Switzerland. Alan E. Kazdin, PhD, ABPP, is Sterling Professor of Psychology and Professor of Child Psychiatry at Yale University and Director of the Yale Parenting Center, an outpatient treatment service for children and families. He is also Director of the Innovative Interactions Laboratory. Dr. Kazdin has served as Chair of the Yale Psychology Department, Director and Chair of the Yale Child Study Center at the School of Medicine, and Director of Child Psychiatric Services at Yale-New Haven Hospital. He has authored or edited over 750 articles, chapters, and books focusing on child and adolescent psychotherapy, parenting and childrearing, aggressive and antisocial behavior, and methodology and research design. Dr. Kazdin is a past president of the American Psychological Association (APA) and a recipient of APA's Distinguished Scientific Award for the Applications of Psychology and Award for Outstanding Lifetime Contribution to Psychology.